Being a new deck, I wanted to know how the deck and I would get on/how we would work together/bond. The colours are bold and striking. Deepest, darkest secrets, strength to strength, union, successful, strong. Face your depths, the dark of your soul. Mirror image. Reflect. Delve the depths, come to the light, layered. Octopus (keeps reminding me of an octopus lol), sea, emotion. Weave in and out. Tell a story. Gain strength, naturally fluent. Honour, merge. Breath of fresh air. Bold, out there. Flight. Shaman. 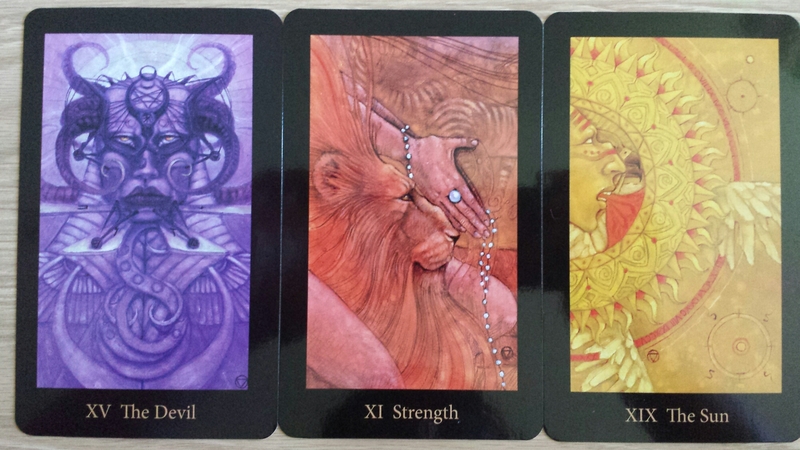 All of the cards images to me have been honoured, revered, celebrated and worshipped. King, supreme, ruler, leader, protection. Working with the cards will bring me balance and become awakened to my truth, it will help me to face and defeat my demons. It will be a stabilizing and enduring relationship. Our two energies will grow and build erupting into a new energy. It will awken the life force within me. The deck’s energy through my hands can create my destiny =) Working together will bring truth and self knowledge. Through it I will rise to my highest self, my fullest potential will be realised. I will learn grow and become powerful – my tool for communication.